Saturday an estimated 400 people gathered on the Dartmouth College campus to encourage the administration to divest the college's endowment from fossil fuels. 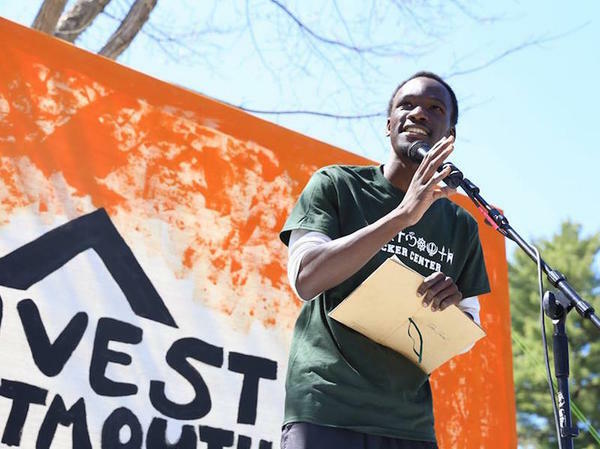 On Saturday, Dartmouth students held what organizers say was the largest climate change-related rally in New Hampshire's history. 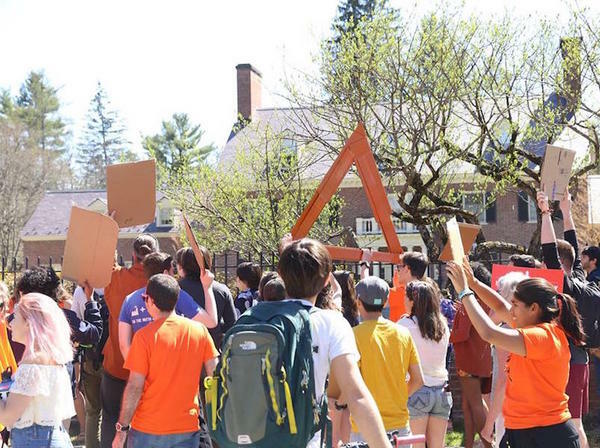 An estimated 400 people were on campus calling for Dartmouth to divest its endowment from fossil fuels. Molly Siegel is a graduating senior and founding member of Divest Dartmouth. An environmental studies major, she said the school should be a leader in divesting its endowment from fossil fuels. “We really want to see Dartmouth become a leader in sustainability beyond just our institution but in the world,” she said on Monday, sitting in a classroom in the Environment Studies Building on Dartmouth’s campus. 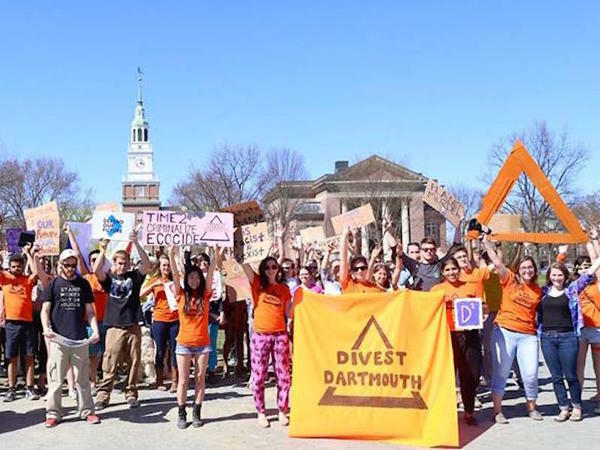 Divest Dartmouth, the student group behind Saturday's rally, calls for Dartmouth to end direct investments from its $4.6 billion endowment in the top 200 fossil fuel companies in the world, which include Exxon and Shell. “A lot of the fossil fuel companies you've heard of and some you probably haven't,” Siegel added. It is unknown how much of the endowment is actually invested in these companies. Siegel said support for Saturday's rally came from many groups, from campus fraternities to 350.org and the Sierra Club. “We had some partners from schools like Harvard, Yale, NYU, Brandeis as well as lots of groups in the Upper Valley,” she said. While Siegel says the people at the rally were probably more than half students, others in the community also attended. New Hampshire State Rep. Lee Oxenham spoke to the crowd this weekend. She said that fighting climate change is the reason she got into politics. “This is a moment in history when everyone has to take responsibility for their actions," she said. But that is not the only reason Oxenham was interested in the Dartmouth divestment rally. She's not a newcomer to divestment movements; during her years as a student, she was heavily involved with the movement to divest from Apartheid South Africa. Oxenham says Desmond Tutu, the South African archbishop and apartheid social rights activist, is a personal hero of hers. Tutu has said the divestment movement was important to the end of apartheid. At his office on the Dartmouth campus, President Philip Hanlon agreed the school should be a leader for environmental change. "Our aspiration at Dartmouth is that through our research and education, we're going to be a highly respected voice, an honest broker in the understanding and directing the energy system and a leader in preparing graduates to have a sophisticated understanding of energy and environment, and are fair balanced and open-minded towards these complex issues,” Hanlon said. When asked whether Dartmouth College had any plans to divest its endowment from fossil fuels, Hanlon shook his head, and waved his hands in the universal signal that says "no comment." Copyright 2016 WVPS-FM. To see more, visit WVPS-FM.